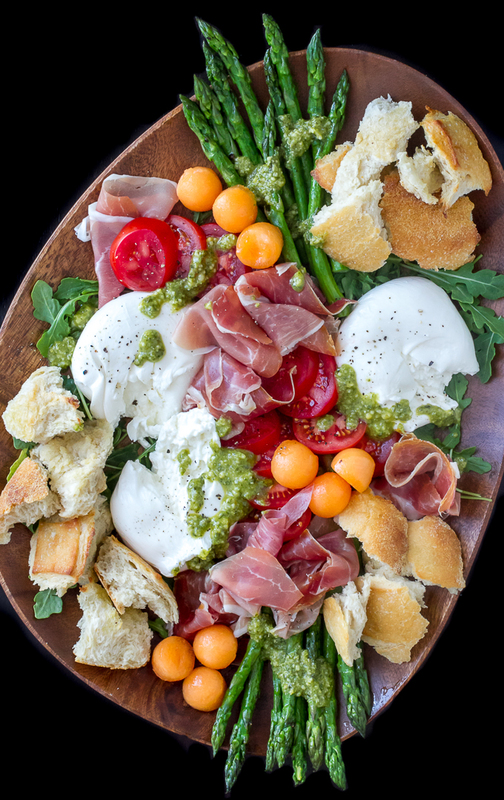 This Prosciutto Burrata Asparagus Salad not only has two of my favorite foods to come from Italy – Prosciutto and Burrata, it also has roasted asparagus, sliced Campari tomatoes, cantaloupe, baby arugula and dollops of creamy homemade pesto. Is it a salad? Appetizer? Antipasto? Doesn’t really matter what you call it, just pile it all on a big platter with some crusty bread and let your family or guests help themselves. This platter is the perfect example of one of my favorite ways to eat food, especially in the hot summer. I know it may not be hot, or summer, quite yet for some people but it certainly is here in Florida! Just set out a big platter with lots of delicious snacking food, grab a glass of wine, and nibble away. It’s so simple to make, there’s really not much cooking involved, mostly just assembling ingredients. The possibilities of what to include are simply a matter of taste preferences. But I recommend you don’t skip the burrata and prosciutto! If you’ve never had Burrata cheese, now is the time to get some! It’s one of my favorites and really is a step above fresh mozzarella. Burrata has an outside “shell” of fresh mozzarella with a creamy mixture of mozzarella and cream on the inside. It’s so delectable and perfectly suited for salads, spread on bread, or really anything. I just LOVE it! I roasted the asparagus for a few minutes but that’s about the only cooking required. Prepare the asparagus however you prefer. You could also toast the torn bread pieces a bit if you want while you have the oven on. I just lightly brushed some olive oil on the pieces and quickly toasted them to crisp them up a bit. Totally optional. Because Prosciutto and melon is such a classically good combination, I had to include cantaloupe. You don’t have to get all fancy and make melon balls if you don’t want, just buy some cantaloupe already cut up at the grocery store and save a step. I think peaches would be delicious here too! To finish it off, I used my favorite homemade pesto (you really should make some, it’s phenomenal) and a grinding of fresh black pepper. You could skip the pesto and just drizzle some olive oil and balsamic vinegar on top (or balsamic glaze) but I like the pesto best. See how flexible this is? It’s pretty much one of those fly by the seat of your pants type of dish. Next time you want something simple and impressive to munch on, assemble this Prosciutto Burrata Asparagus Salad, pour a glass of wine (or your favorite non-alcoholic beverage) and call it a day! Oh, and don’t forget some good crusty bread to go along with it. This Prosciutto Burrata Asparagus Salad makes a great antipasto appetizer. Adjust amounts or ingredients to your liking and number of people serving. Roast asparagus, heat oven to 425º. Place asparagus on baking sheet and drizzle with a bit of olive oil and sprinkle with salt & pepper. Roast about 4-5 minutes, just enough to get them slightly cooked but still a bit crisp. Set aside. Assemble: Scatter a couple handfuls of arugula over large platter. 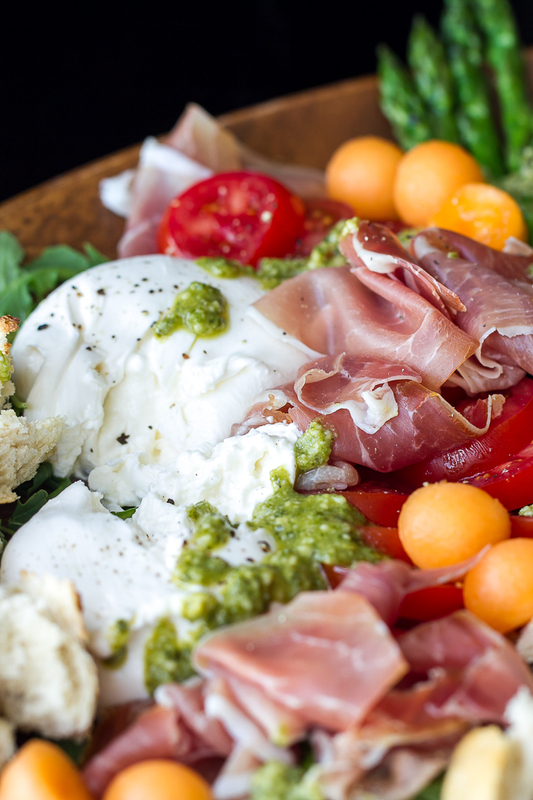 Arrange the burrata, prosciutto, asparagus, tomatoes, cantaloupe. Dollop with some good pesto. Grind some fresh pepper over top. Serve with pieces of good crusty bread. *I roasted the asparagus. You could grill it or steam it too, however you prefer to cook your asparagus. Just be sure to keep it crisp! This is the way we love to eat. A little bit of some fantastic food. Proscuitto is a must. OMG I love everything about this salad… it just scream Spring and has all of my favorite foods in it… Prosciutto is my weakness lately. Proscuitto is always a weakness of mine…and ice cream! These photos are amazing. After a rocky start with burrata (I saw it marked down in the fancy cheese section in a container similar to fresh mozzarella, and went to ‘slice’ it and put it on a pizza . . . .) I have embraced the gooey ahem creamy center. Each time I find it marked down I’ve made a pasta dish, and now that it’s warming up I’m delighted to try this salad. Oh my, that would be quite a surprise if you were expecting mozzarella! Oh my! This has all of my favorite things on one plate!! Gorgeous spread. How many people do you think this would serve as an appetizer? Wow, that’s a tough question to answer. I guess it would depend on if you were serving other appetizers as well, will there be a dinner served or just this platter to snack on… I’d guess 10 or so? Really don’t know, depends on how hungry everyone is 🙂 The nice thing about this type of dish for an appetizer is you can have extra ingredients in the fridge and if you run out of something just refill. My husband and I ate this for dinner and we had some leftovers. Hope that helps! I agree… this is the bomb! So happy you gave it a try and enjoyed it. I bet the mushrooms were a fantastic addition! I love to put out a big platter like this, open a nice bottle of wine and enjoy the evening with my hubby. we loved this! everything is paired perfectly. we had it with eggplant stuffed ravioli cooked with pancetta, diced tomatoes, arugula and basil. just delicious! So glad you enjoyed it. Your eggplant ravioli sounds delicious!! !